Young people of this age are at a catechetical age. 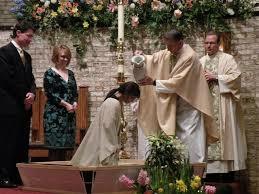 They will be welcomed into the life of the Church through an age appropriate Rite of Christian Initiation. Through a combination of prayer, group discussion, reflection and rituals they will be welcomed into the life of the Church. This will take place over a number of months. They will be initiated into the Church at the Easter Vigil. Crossroads is a resource to accompany young people seeking initiation into the Catholic Church. There are 3 resources for the following age groups: 9 – 12 years; 13 -16 years; 17 – 19 years. Click link for further information crossroadsrcia.org/?